Pre heat the oven 200c. Use pastry to line a greased 26cm tart pan. Trim any excess pastry. Line the pastry with baking paper and baking weights or uncooked rice. Bake for 8 minutes. then remove paper and weights, and return to the oven for another 3 minutes. Cool slightly. 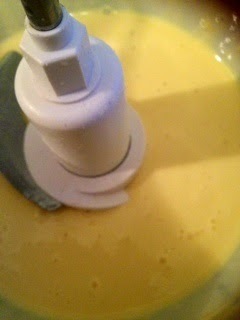 Place the ricotta, mascarpone, sugar, lemon juice and zest in a food processor and whiz until smooth. Pour mixture into tart case. Bake in the oven for 30 minutes. Set aside to cool. Meanwhile for the candied lemon, place sugar and 2/3 cup water in a frypan over medium heat. Bring to a simmer and cook for 5-8 minutes until sugar starts to turn golden. 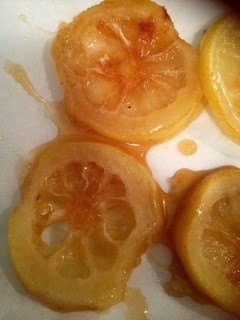 Add the lemon slices and cook for a further 2-3 minutes until well coated. Then transfer to baking paper lined tray and set aside to cool. 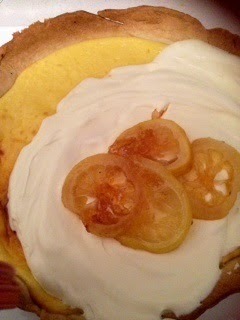 Top tart with cream and candied lemon.